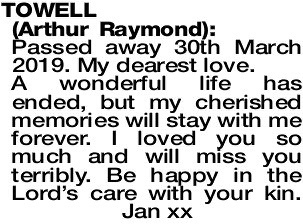 Passed away 30th March 2019. My dearest love. A Service to celebrate the life of Mr Arthur Raymond Towell of Albany will be held at ALLAMBIE Park Cemetery, Albany on THURSDAY (04.04.2019) at 1.30pm.